There is still time to get your tickets for A Date with Your Dog! We are only a few days away from this event! RSVP today! Don't forget to RSVP for your night out with your pup! Tickets can be purchased at the door, however, we encourage participants to RSVP ahead of time for most efficient entry to the event. Purchase your ticket today! Please join us for a fun night of activities, light refreshments, a silent auction and above all, a fun, social night out for you and your dog! This event is a great opportunity for you to have a fun evening out with your dog while supporting a great cause, CAWS! We would love if you and your doggie date could join us to celebrate the work that CAWS does for the community each day. You don't need to have a doggie date to attend! There will be activities and fun for everyone and we welcome all CAWS supporters and friends alike! If you are planning on bringing your doggie date, please read below. This event consists of an off-leash area for your dog to roam and play. Due to the nature of off-leash and Barley's Canine Recreation Center's rules and protocol, CAWS asks that no aggressive dogs attend*. 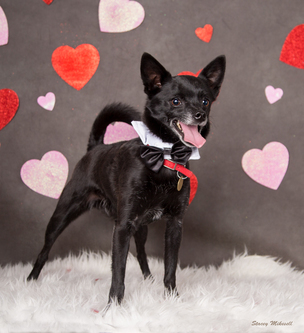 After RSVP-ing, a waiver from Barley's Canine Recreation Center will be emailed to you to fill out and return in order for your dog to be your date. *CAWS and Barley's Canine Recreation Center reserves the right to ask any aggressive dogs and their owner to exit the fundraiser in the event that any aggressive dog behavior occurs. Thank you for your understanding.